"There're not many angels around anymore. Not in my work." The Virgil Flowers series by John Sandford is one of my all time favorites. Flowers, a quirky investigator who has his own way of going about his job, is one of the most charismatic and unconventional leads in a popular mystery series. His long hair, obscure music group t-shirts, and cowboy boots make him instantly recognizable by wardrobe alone. His reputation as maverick investigator who solves "the hard ones" places him in some of the most dangerous situations that the state of Minnesota has to offer. Storm Front finds Flowers in an investigation that has stakes reaching far beyond the jurisdiction of the Minnesota Bureau of Criminal Apprehension. Elijah Jones is in the biggest trouble of his life. For years, Jones has cared for his wife who suffers from Alzheimers. Now, as he faces his own terminal cancer diagnosis, Jones sets a plan in motion that could potentially keep his wife cared for long after he has died. During a recent archeological dig in Israel, Jone's team discovered an ancient artifact that seemingly alters history dating back to the Bible. He smuggles the artifact home to Minnesota in the hopes of auctioning it to the highest bidder and securing the wellbeing of his wife for years to come. Enter Virgil Flowers. He is busy investigating a petty case of local fraud when his boss Lucas Davenport gives him a call. Shortly after, Flowers is at the airport picking up an Israeli expert who he will assist in retrieving the artifact. But Israel is not the only party with interest in the relic. The history and religion altering implication of the ancient stele has a host of parties from around the world racing to retrieve it. From an American television personality to a notorious terrorist, it seems like everyone wants to get their hands on the artifact. This leaves Virgil in a unique situation. Is an ancient rock really worth dying for? As with the previous novels in this series, it is really fun to read about Virgil Flowers working out a case in his unique way. 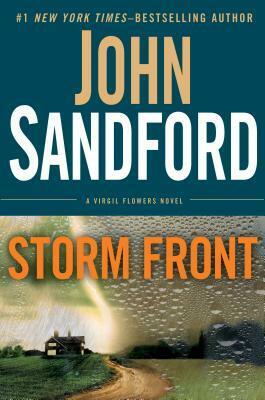 John Sandford writes with a crisp urgency that makes Storm Front a real page turner. That being said, this is the first novel in the series that I didn't come out of wanting more. The plot of this book strays a bit to far from reality for me. The globe spanning historical implications of the premise seem more fitting to Dan Brown's Robert Langdon than Virgil Flowers. Flowers seemed so out of place, in fact, that I found myself more interested in the subplot of antique lumber fraud than the main story. Some have suggested that Sandford may have employed another author to help him write this novel. Whether this is true or not, Storm Front, is an installment that does not reach the height of the novels that preceded it. For the sake of his fantastic character, I hope this novel does not mark the beginning of a decline in what remains one of my favorite series. This entry was posted on Monday, September 12, 2016 and is filed under Book Review,Dan Brown,John Sandford,Storm Front,Virgil Flowers. You can follow any responses to this entry through the RSS 2.0. You can leave a response. I love a good PI mytery Ethan, and love the sound of the protagonist. I will check out book one!